This was so cute in my head last night. 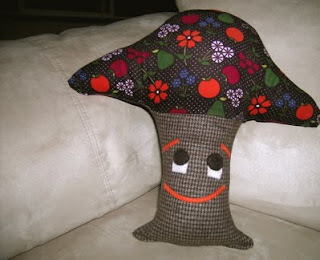 I was going to use this adorable fabric my mom bought me to make this little toadstool with a happy face. Well. He looks less like a mushroom, and more like a crazy tree from the 70's that stole Cpt. Crunch's hat. Can't win 'em all I guess, right? On the plus side, I did make a pillow that I absolutely love last night, but the flash card on the camera I'm borrowing died, so I don't have a picture of that today! What is it with me and cameras lately!?! 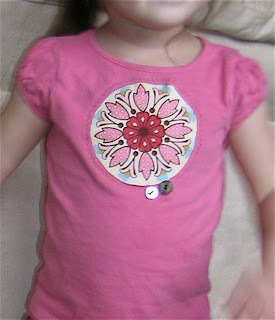 I also updated one of the little cookie's t-shirts, using the tutorial at Lil Blue Boo. 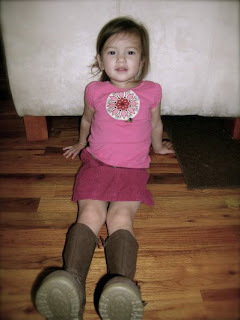 I love this idea, it's so easy and quick! Cute top, and I love the cute little face on the mushroom pillow. It does look like a tree, but a cute tree. I like the mushroom tree!! The fabric is amazing, and I certainly don't think it's the ugliest pillow ever!!! 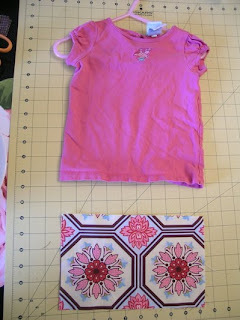 Love what you did with your daughter's shirt- so many good ideas!! The shirt looks so adorable. I've been wanting to do stuff like that with my girl's clothes I need to just start. Thanks for the link. Stopping by from SITS...I can paint, but you make me wish I could sew! Thank you for sharing your talent. Hey girl, happy Labor Day! I just found you on SITS! I love your description of the pillow... Cap'n Crunch, eh? LOL Visiting from SITS. Hey! come see me. I'd be thrilled! ha ha ha! Lovin' the pillow! You should post it at CraftFail.com! !